No better way to boost my metabolism and have fun in the community than to participate in the 43rd Annual YMCA Turkey Day Fun run. I knew what to expect as far as chilly temperatures. I ran in the same conditions a few days ago with my group. 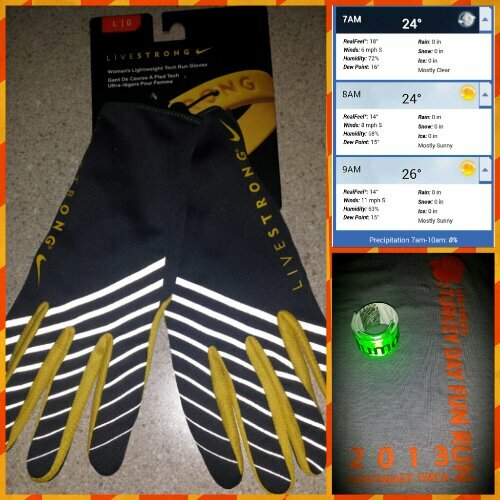 I purchased a pair of Livestrong women’s lightweight running gloves to provide protection to what was early signs of frostbite the other day. I arrived at the Northeast YMCA an hour early and there were plenty of parking spaces. The atmosphere was very laid back and family oriented. I chatted with a college student majoring in Kinesiology up in Wiscosin to pass time. I spotted a familiar face of Lynn Riedling. She’s one of my running idols. At 54 years old, she slays 5ks like a high school cross country champion. She’s a 1st grade teacher too. Lynn totally rocks! The race started at 8:30 and the feel like temps of 14 degrees were no joke! I used vitamin E oil to protect my face and blistex for my soup coolers. My hair was in a protective bun with coconut oil. My first mile split was 6:56. My hands were still cold with the Livestrongs. I even doubled up with a pair of the freebie cotton gloves from a race last winter. It was so cold that the half way water stop had to use bottles because the smaller cups would have frozen. I felt so bad taking two sips from a slushy water bottle and tossing. Finally, I can hear the DJ and announcer so I knew the finish line was near. I dug deep for the last quarter mile and sprinted towards the finish. My time was 40:35 landing me 3rd in my age group. The race is advertised as a 10k but part of the fun is to guess the distance up to a thousandth of a mile. The official distance was 6.040. The top three men and women were awarded turkeys and trophies. First place in each age division were awarded trophies as well. I stuck around for the door prizes and I saw a family from the Throo the Zoo race. The mother told me her boys have been doing this Turkey Trot since they were 2 yrs old. I sipped hot tea and cheered on the women’s division winners before I parted ways. This will be an annual event for me as it is for many others. There were participants from 23 states. 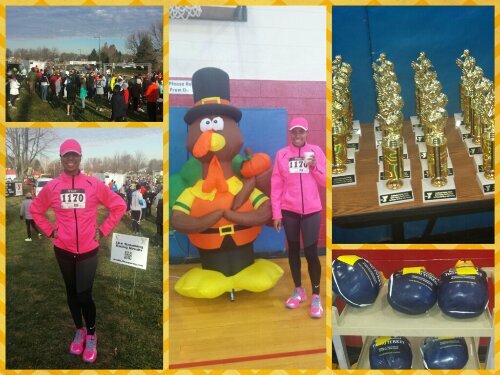 This entry was posted in family, fitness, Louisville, running and tagged Turkey Trot. Bookmark the permalink. GREAT job on the run! Always fun to make a calorie dent before the holidays, right?! Thank you! I think spinning helps my speed more than running. I don’t do speed work runs. Wow…I feel SO slow. Congrats. The chill made me feel some type of way! Thank you! A guilt free dinner was the award.